Ovarian Cancer is the fifth leading cause of cancer-related deaths. It is estimated that 1 woman in 75 will develop Ovarian Cancer in her life. 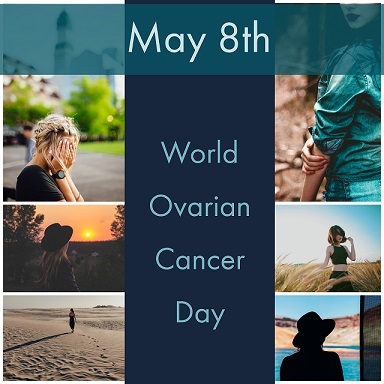 This day is special for me because Ovarian Cancer impacted my life at a very impressionable age. My mom was a massage therapist in the late 80’s and early 90’s and modeled in New York City. Fun fact, she was a part of Nicole Miller’s first fashion show! She was a Pilates Instructor, saw a Traditional Chinese Medicine doctor, ate clean, lived clean, and was always in super fit shape. Her Family Health History was clear except for a few family members with high blood pressure and high cholesterol. In short, my mom was the image of health and wellness. In the summer of 2003, Mom noticed she was bloating around her middle, thinking it was from too much Starbucks or wine. She exercised and refined her diet; however the bloating did not go away. Late fall came and she felt something was off since the bloating was only getting worse. She went for a routine pap smear and it came back negative. She insisted to have more tests done and something was still not right. In early November she had a surgery scheduled to remove a mass found on her right ovary, around the size of a golf ball. Time stopped when the doctor diagnosed my mom with Stage 2 Ovarian Cancer at 33 years old. I was 11 and had just started middle school. Never had I thought about a life or existence without my Mom. Her doctor started her with a full hysterectomy and chemo treatments every two weeks for 24 months and 8 treatments of Carboplatin-Taxol. They were being extremely aggressive with her. When I would go with her to treatments, we would meet women in the chemo suite who were 26, the age I am now, and even younger. My Mom’s OB/GYN told me that Ovarian Cancer is usually found in older women after the diagnosis of Colon or Cervical Cancer, which is actually Ovarian in origin. Ovarian Cancer historically has not been found in women so young. I have personally met girls, within the last three years, as young as 8 years old being diagnosed with Ovarian Cancer. This type of cancer has an estimated 239,000 new cases and 152,000 deaths worldwide. My mom liberally used talcum powders, petroleum jelly, sunscreens, and plastic-based products since her pre-teen years. There are numerous studies which suggest these chemicals enhance your risk of Ovarian Cancer. During her Cancer Odyssey, Mom had a heart to heart with her OB/GYN. He expressed he believes the amount of stress she endured along with chemical-laden products she had used was most likely the cause of the cancer, and her ovaries were her Achilles Heel. Her mother had died when she was young and by this time our family had moved 14-15 times in 11 years. Find an OB/GYN you completely trust, be honest and open with them, and remember you are allowed to be picky with your doctors! Get your yearly pap smears and ask for a CA125 test. A pap smear only looks at the uterus and cervix; the CA125 test measures the Cancer Antigen 125 protein levels in your blood, and may detect ovarian cancer earlier than in women who were not tested. I am thankful for the doctors and nurses that supported my mom during her treatments. Less than 50% of women make it pass their 5 year remission mark before they are diagnosed again. I am happy to yell from the rooftops my Mom is 17 years Ovarian Cancer free! My biggest message to all the wonderful women in my life and those who support women is to truly be interested in your stress management. Over the last few decades there have been many studies about the link between chronic stress and the development of cancer. Please make it one of your biggest priorities. Even for one minute a day. Embrace it as much as you can. Stress can kill you, I saw it firsthand. 1. Educate yourself on clean products for your lifestyle. There are so many chemicals in our makeup, facial cleaners, shampoos and conditioners, and incontinence products. Please read your labels! 2. Simple Meditation or Breathing Exercises. 3. Eat well. Everything you eat becomes a part of your structure. Red blood cells have a life cycle of about four months, white blood cells on average last for more than a year. The lifespan of a skin cell is about two or three weeks. Colon cells die off after four days. 4. Make yourself a priority! All women need to hear this friendly reminder often. 5. GET ADJUSTED! It definitely helps you be your best you and manage the three T’s! Thoughts, Toxins and Traumas! Women are beautiful beings with the amazing power to give life and love. Please treat your body well, you only get one. Happy Mother’s Day, from Aly and the ANHC team. Thank you for sharing this, Aly! You're welcome Pat! Glad it was helpful!